Best dodgeballs and the brightest game ideas. 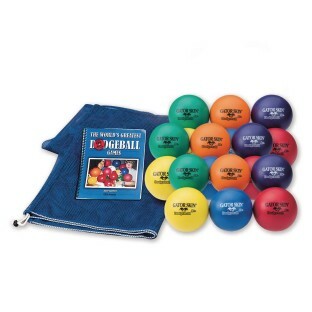 18 super safe Gator Skin® dodgeballs; extra large storage bag; Greatest Dodgeball Games book. Get it all at an unbeatable Easy Pack price. Early Elementary set includes 5" dodgeballs. Ages 5 to 8.Gator Skin® is a registered trademark of S&S Worldwide. The best dodgeballs and the brightest game ideas! Includes 18 of our super safe, extremely durable Gator Skin® dodgeballs, an extra large storage bag and the 58-page World’s Greatest Dodgeball Games book, your go-to resource for fun, inclusive activities. Get it all at an unbeatable Easy Pack price! Early Elementary set includes 5" dodgeballs. Ages 5 to 8. NOTE: This warrantee does not apply to commercial use (for example, trampoline parks).